Corrie burns a mock American flag before Palestinian children. This is the second in a series of three posts planned about the (recently closed) productions of My Name is Rachel Corrie and Pieces at the New Repertory Theatre. After seeing both performances, I found myself intrigued by the issues of personal-vs.-political presentation they seemed to raise. Below is a conversation (via email) I had with Meron Langsner, Playwright in Residence at the New Rep, and the coordinator of the talkbacks, readings and discussions that surrounded the performances, as well as co-editor of the printed companion piece to the event, "Supporting Voices/Dissenting Voices." HR: Many people saw the pairing of Pieces with My Name is Rachel Corrie as an attempt to "balance" the polemic of Corrie. The Boston Globe critic felt that it was "a pity that the New Rep found it necessary to create this kind of balance" because "the two plays together force us to view them through a reductively binary lens" and "no two plays in the world can exactly balance each other." Do you have any thoughts on those criticisms, or a response? ML: Though I understand the impulse to reduce these plays to a position of binary opposites, to do so is really to miss the point of the entire project. As I said in many talkbacks as well as in the New Rep newsletter, these plays were not intended to present opposite sides of the conflict. To reduce the situation to two points of view is an extremely dangerous oversimplification. The phrase that we took as our theme was one I borrowed from Shai Feldman of Brandeis University; we were looking to gain a "more sophisticated understanding" of the situation. The sort of sophistication we sought would imply far more than two sides, and, as the plays that we produced were NOT binary opposites in terms of political stance, that sort of reductionism really doesn't apply. What I would have liked would have been for more people to take in the event as a whole. Not just the two productions, but also the readings and films and academic panels. And of course the essay booklet. By taking in the entirety of the project, an audience member could have taken in far more views of the situation and gained a greater understanding of the artistic response. HR: I felt that Pieces, although it dealt with a young woman who chose to serve in the Israeli army, didn't offer a strong political response to the statements of Corrie. (And the other play which had to be withdrawn dealt not with the Palestinian conflict but the raid on Entebbe.) In effect, the pairing amounted to a double bill about the life choices of two young "American" women (although Tirosh was Israeli, she returned to Israel from living in New York City). The Boston Globe explicitly reacted to the plays in this way ("The almost giddy young girl we met at the outset [of Corrie] has, by the end, grown into a far sadder, more complicated, and yet still resiliently optimistic woman."). Do you feel that implicit frame helped mute the reaction to Rachel Corrie (it seemed there was far less protest than the play has seen elsewhere), and do you think that, intentionally or no, the evening ended up re-framed as a tale about the political choices of two “American” girls, rather than about Israelis and Palestinians? ML: I have to say that "the political choices of two ‘American’ girls" isn't really an appropriate frame. Zohar is an Israeli citizen who was doing her mandatory service and really did not have a choice in the matter. It would be like an American teenager's "choice" to go to high school. In truth I really don't find Pieces to be overtly political. I found it to be more of a slice-of-life play that happened to take place at a crossroads in history. The talkbacks ended up being far more politically oriented than the play itself. Name is Rachel Corrie (though I do not have box office numbers in front of me) had larger audiences than Pieces. The frame of two young women's choices implies that everyone saw both plays. As for the idea that the plays served as proxies for political statements, that was something we did not intend at all. I know that My Name is Rachel Corrie is in fact a strong political statement, and perhaps the controversy around it caused the impression of polarized opinions, but once more, the entire event - talkbacks, panels, readings, and screenings - is really what I would want to have remembered, not just the two plays. I don't know if the reaction was really muted. We were criticized by people who were strongly pro-Palestinian for not presenting the Corrie piece by itself, and there was an occasional leafleter outside the theater handing out anti-Israeli material. There were voices raised against the Corrie piece as well, and occasionally talkback sessions did get heated. Also, I would add that we met with several community leaders who had a stake in the issues that these plays were about. On the whole they seemed to understand what we were trying to do with this event. 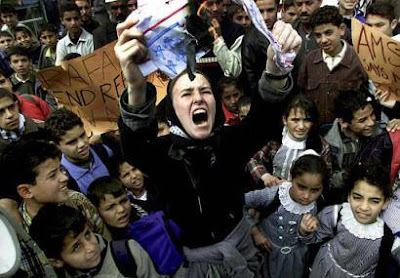 HR: In your essay on the two plays, you mention that "poetic license is in effect" in the structure of My Name is Rachel Corrie, and you (bravely, I thought) point out that her journals, emails, and statements have been "edited," and that the play has political "blind spots" - Rachel (at left, in Gaza) never burns a mock American flag, for instance, as she was photographed doing (above). You justify this "blind spot" by stating "the character arc of their [i.e., Alan Rickman's and Katherine Viner's] Rachel would be broken by including such an event." Your argument, of course, would be quite strong if the "blind spots" didn't feel so politically coordinated. But they do feel politically coordinated - which could be interpreted as an artistic flaw. That is, shouldn't a true work of art about a political agitator consider its central character's politics fully, rather than simply from the character's perspective? Especially since Rachel's statements do offer a chance for such a consideration, which her editors have avoided? ML: This question is perhaps the most difficult. I can't know or fully understand the motivations of the plays' editors. I agree that the edits appear politically motivated, and I disagree with the position that those edits appear to espouse. But if the dramaturgical task they set themselves was to create a sympathetic Rachel, they succeeded. I would in fact argue that they were not trying to create a play about a political agitator. We never experience the character of Rachel as aggressive, because the structure of the play would not support it. I think that Stacy Fisher (at right, as Rachel) gave an outstanding performance and I was highly impressed with David Gammon's directing. Their artistic choices added to the sympathetic nature of the character, and put theatricality into the script where it was not inherently present. I cannot see the character that Stacy created burning a mock American flag. As for the relationship between art and politics, that is a far longer discussion. HR: I was intrigued by the attitude toward "the other side" in the opposing pieces. Zohar Tirosh, although never treating the Palestinians directly, nevertheless seemed to yearn for peace with them and regretted their situation, and seemed to imply that Rabin's assassination was a setback for Israel in moral terms. 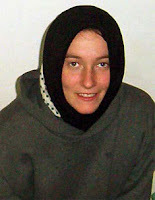 Meanwhile Rachel Corrie made no attempt to dramatize the Israeli position, or its possible justification. Do you feel, therefore, that the evening was politically "balanced" at all? Or could it ever be, given that, ironically enough, a dramatization of Palestinian terrorism might be even more controversial than My Name is Rachel Corrie? ML: Again, I want to repeat that "balance" is not necessarily an appropriate frame for this project. As for dramatizing terrorism, two of the plays that were given readings, Nitzan Halpern's Sow and Weep and my own b'Shalom had suicide bombing as central topics. In both cases that subject created very strong negative reaction in certain audience members. So I agree that a dramatization of suicide bombing would have created controversy. There is a sort of apologist attitude towards terrorism against Israeli civilians that I find is all too common. HR: I'm also curious how the talkbacks and other programs around the plays worked out. Did you feel a "dialogue" was indeed generated, or did participants seem more or less entrenched in their respective positions? Any thoughts, based on your experiences, on how other theatres might approach such "live wire" political plays in the future? ML: The greatest forums for dialogue in my opinion were the panel discussions that we set up. I believe that those expanded people's points of views the most. In terms of the talkbacks for the plays, those varied night by night. I found that many interesting comments came from people who had already seen one play and had just experienced the other. There were also nights when most of the discussion was (rather surprisingly) not politically motivated at all. As for how other theaters might approach such plays - I think New Rep did a very brave thing with this event, and not something that I have heard of any other theater doing. By creating a forum for multiple points of view we actually opened ourselves up to criticism from every side, and yet, once people understood what we were trying to do, they seemed more willing to listen to representations of opinions that they might disagree with. That said, on a practical level I found the essay booklets to be a wonderful intellectual addition to the program. The spectrum of ideas represented in them side by side was a great example of what we were trying to do with the entire series, and that the booklet can stand alone as a lasting document can really only help further a greater dialogue.